This followed additional security measures, including the deployment of 15,285 policemen, put in place by the Nigeria Police Force in Southern Kaduna. According to Punch Newspaper, the acting president demanded an explanation over the recent resurgence of violence that resulted in the deaths of 21 persons, despite the security measures and level of attention to the area. 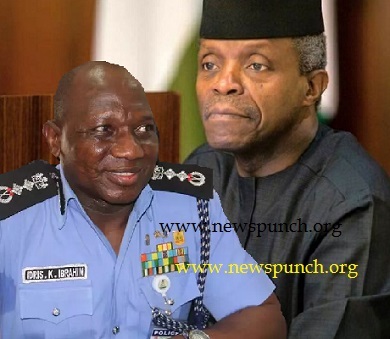 It was learnt that Osinbajo invited the IGP to the Presidential Villa to find out what the police was doing to end the crisis and to issue further directives on restoring law and order to the affected communities. Our Source gathered that the outcome of the meeting with the acting president was the decision to intensify security with additional measures that would help contain the situation. Besides deploying over 15,000 police officers in the area, it was also learnt that the Police High Command had concluded arrangements for the establishment of a new police squadron in Kafanchan, Kaduna, as part of broad measures adopted to curb the violence. It was further gathered that 18 Armoured Personnel Carriers and a unit of Belarus-trained Police Special Forces had been deployed in Southern Kaduna. The police, in addition, were said to have increased helicopter surveillance in the entire area to prevent a recurrence of violence in the communities. No fewer than 38 suspects were said to have been arrested in connection to the violent attacks, while 29 firearms were recovered. The IGP was said to have given the assurance that there would be greater police presence and security in Southern Kaduna. Plans are underway for a briefing on the overall security situation of the country. 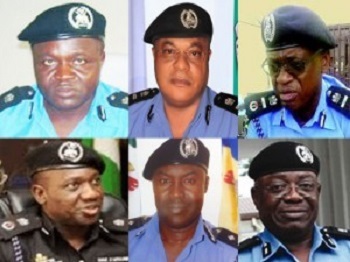 Sahara Reporters - Several senior and mid-level police officers have provided SaharaReporters with a list of grave acts of corruption allegedly committed by Inspector-General of Police (IGP) Ibrahim Idris. The officers, some of them retired but most still in active service, stated that the IGP’s notoriety for embezzlement of funds, frequent abandonment of his post, and sexual liaisons with subordinates preceded his time as the Commissioner of Police for Kano State. The allegationsraise serious questions about Mr. Idris’s fitness to lead the police force in the administration of President Muhammadu Buhari with its vow to build public trust in institutions. One of the most alarming allegations against Mr. Idrisrelate to the unlawful sale of thirty vehicles. “Idris should be investigated on the circumstances leading to the disappearance of about 30 vehicles which are known to have been released to fictitious claimants,” one serving police officer said. The illicitly sold vehicles include a Honda Accord, registration number BP 529 KMC, sold to an Ahmed Sani Mohammed of Kano State, a Honda Civic, registration number BH 742 NSR, to an Ibrahim Jamilu of Kano State, a Toyota Sienna, registration number RBC 501 AM, to a Hajiya Safiya Danlami of Kano State, a Nissan Murano, with registration number NSR 389 XV, to a Datti Abubakar of Kano State, an unregistered Honda Civic to Garba Shehu of Kano State, and an unregistered Toyota Matrix to a Friday Kassimu also of Kano State. According to our police sources, other vehicles disposed of in shady circumstances include an unregistered Mercedes Benz, a Volkswagen Golf 111, and a Toyota Lexus Jeep.The sources disclosed that the addresses associated with the so-called buyers of the vehicles are incomplete—often without street numbers or phone number contacts. The incomplete addresses have made it impossible to authenticate the identity of the buyers. “It is all part of the IG’s ploy to conceal his wrongdoing. We urge the Presidency to order a probe into the so-called sale of these cars. They will find that the truth is that Idris acquired most, if not all, those vehicles for himself,” one senior police source said. Police sources told our correspondent that Mr. Idris was a practiced hand at the selling of public property for private profit. They alleged that he played a key role in the unlawful sale of police property in Kano State outposts for personal gain during the height of the Boko Haram crisis. Another officer corroborated the account. “Idris has the habit of dismissing senior officers during official hours to spend time with Amina who even poses for photographs in his office,” said the source. The sources told SaharaReporters that the IGP transferred Amina to Abuja where she is now living luxuriously in a hotel and driven about in a Frontier Jeep—all her expenses allegedly paid for by Mr. Idris despite his meager public servant salary. Our sources alleged that Mr. Idris’s extravagant lifestyle extends to the United States where he has a spouse, a woman he met while on a peacekeeping mission in Liberia. The US-based wife, Maria Idris, is of Liberian descent, and reportedly has two children for the IGP. Our sources said Mr. Idris has been supporting his US-based wife, questioning how he can afford such expenses on his police salary. “The IG’s maintenance of a family in faraway America is repeatedly discussed by fellow officers. We wonder howhas been able to pay for the expenses of his second family in the US,” one source told SaharaReporters. Other police sources said they were dismayed that President Buhari chose a man as IGP who lacks operational expertise and courage. One officer alleged that, as the Commissioner of Police in Kano, Mr. Idris locked himself inside a toilet for hours during an attack by Islamist insurgents belonging to Boko Haram in Kano. “During a Boko Haram raid in 2012, the then Commissioner of Police [Mr. Idris] locked himself in the toilet for hours at the State Police Command Headquarters,” said the source. He added that Mr. Idris’s hiding allowed Boko Haram fighters to move through Kano unimpeded, killing men, women and children as well as police officers. Several officers contrasted Mr. Idris’s cowardice with the bravery displayed in Borno State by the Commissioner of Police, Simeon Midenda. They said Mr. Midenda joined some agents of the Department of State Security (DSS) in a fierce battle with Boko Haram insurgents. They added that Mr. Midenda’s efforts led to the killing of numerous Boko Haram insurgents. Our sources, including a member of a watchdog group, also accused Mr. Idris of leading a crop of officers who carried out extrajudicial killings in Kano State during a period of assaults by Islamist terrorists. SaharaReporters repeatedly reached out to Mr. Idris for comment on these allegations. However, he declined to take our calls and did not respond to text messages. SaharaReporters spoke to one of Mr. Idris’s deputies who said the IG was in a meeting and would return our call afterwards. Mr. Idris never rang back. The Assistant Inspector-General of Police (AIG) Amodu Ali-led Special Investigative Panel (SIP) has invited Dogara, his deputy Yusuff Lasun, Chief Whip Alhassan Ado Doguwa and Minority Leader Leo Ogor to appear before it on Friday. The panel yesterday had what was called “a preliminary session” with ousted House Committee on Appropriations chairman Abdulmumin Jibrin, who accused Dogara and others of padding the budget with N284 billion. The All Progressives Congress (APC) has met with the warring Dogara and Jibrin to resolve their differences. Jibrin was at the party’s secretariat in Abuja where he met with the National Working Committee (NWC) members. 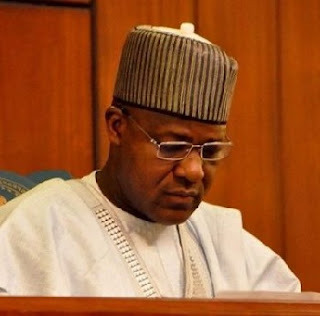 Dogara was said to have earlier met with the committee. The day of the meeting was, however, not given. Last Monday, Jibrin petitioned the police, the Economic and Financial Crimes Commission (EFCC) and other anti-corruption agencies over the matter. Jibrin was said to have “furnished the SIP with vital information and a heap of documents” at their meeting yesterday. The source said: “We have commenced full investigation into the N284billion budget padding in the House of Representatives based on a petition from Hon. Jibrin. ”A Special Investigative Panel (SIP), with a crack detective, AIG Amodu Ali as the chairman, is the one saddled with the responsibility of looking into the allegations in the petition. The same Ali uncovered the lid on the $620,000 bribery scam in the House for which a former Chairman of the House Committee on Fuel Subsidy Management, Mallam Farouk Lawan, and the Clerk of the committee, Mr. Boniface Emenalo were indicted. The case is in court. Asked of the preliminary work done by the SIP, the source added: “As I am talking to you (4pm yesterday), a letter of invitation has been addressed and sent to the Speaker, the Deputy Speaker, the Chief Whip and the Minority Leader. “They will be interrogated by the SIP on Friday. As a prelude to the invitation of the principal officers, the SIP chairman and members had a session with Jibrin on Tuesday. “It was not a grilling session. But Jibrin furnished the team with vital information and a heap of documents to back up the petition he submitted on Monday. Also yesterday, Jibrin confirmed that security has been beefed up around him by the Department of State Service (DSS) and the police. He also asked the All Progressives Congress (APC) to prevail on Dogara to reconvene the House and step aside to face prosecution for alleged budget padding. Jibrin, in a message on his Twitter handle, said: “My attention has been drawn to media reports that I have been summoned to appear before a disciplinary committee of our great party. “That I received a letter yesterday evening (Monday) inviting me to a meeting in respect of the crisis in the House on Tuesday (yesterday) by 2pm at the party’s office. “The letter did not in any way indicate it as a disciplinary committee. And I have responded that I will attend the meeting despite my tight schedules shuttling between security and anti-corruption agencies to provide support and evidence against Speaker Dogara and nine others. SPEECH DELIVERED BY THE NEW AG. INSPECTOR-GENERAL OF POLICE, IBRAHIM KPOTUN IDRIS, MNI, PSC, ON WEDNESDAY, 22ND OF JUNE, 2016 AT THE NIGERIA POLICE FORCE HEADQUARTERS, ABUJA. It is with great pleasure and sense of responsibility I address you this morning as the new Ag. Inspector General of Police of our beloved great country. I want to thank Almighty Allah for this day and want to show my utmost thanks and appreciation to the President, Commander-in-chief of the Armed Forces of Federal Republic of Nigeria, and the Chairman of the Nigeria Police Council, President Muhammad Buhari, GCON, for having the trust and confidence in me and for appointing me to this exalted position. I promise not to fail this nation in our quest to make the citizens of this Country safer and also to ensure that our nation remained united and peaceful. I want to use this opportunity to inform you of our policy direction in the management of our Police Force from this day. The Nigeria Police Force will henceforth be guided by the international core values of policing with integrity, ensuring that the rule of law prevails in our actions and activities, and to strictly respect diversity, courage, compassion and professionalism. The Nigeria Police also would operate within the principles of Democratic Policing which is an institution that is responsive, respresentive and accountable to its citizens at all times. The Nigeria Police Force will henceforth, have as its main focus, integrity and accountability as its cardinal operational principle in all its actions and will be decisive on any of its personnel that deviate from its core values. Responsive Police Institution: – It will be against work ethics henceforth for any Police Commander at any Command level to treat complaints with levity, and complaint received from members of the public must be treated within shorted possible time to the satisfaction of the complainant. This is in line with one of the principles of democratic policing which states that a democratic police institution must be responsive to the yearnings of the community. Transparency and Accountability in the Management of Police cooperative and Police insurance schemes:- The management of Police Cooperative and insurance schemes which are investments made by the members of the force will henceforth be made more transparent and accountable to the generality of the police personnel, especially the ranks and file who constitute the largest contributors. A lot can be achieved in our efforts to enhance the welfare of the police personnel through genuine utilization of these two investments. The accounts of these institutions bodies will be made more transparent and accountable to the entire members of the force, and contributors will have more say in the running of these accounts and on how their investments will be utilized on daily basis. Strengthening of the Police X-Squads Units to fight corruption amongst civil servants: – In our effort to give a boost to the current administration’s war on corruption, the Police management will strengthen the police x-squad units in the Police Commands with the deployment of thoroughly vetted, selfless and patriotic officers to tackle corruption and abuse of office within the police organization and amongst the Federal, States and local government levels. The personnel deployed to this anti-corruption unit will be supported with incentives to make them more effective in the discharge of their duties. Cheap and Affordable Housing for Ranks and File:- This administration will leave no stone unturned to look into the issue of provision of cheap and affordable accommodation for the police ranks and file to own individually. Availability of Police Uniforms and accoutrement:- Making uniforms and accoutrement available for members of Ranks and File will be a priority of this administration. Henceforth, appearance of every police officer will be taken seriously. The incumbent Inspector General of Police (IGP), Solomon Arase's will by June this year retire, having attained the mandatory retirement age of 60. POLICE chiefs reportedly lobbying to replace Arase are; AIG Hassan Bala Abdulahi, AIG Johnson Ogunsakin, Olufemi Adebowale Adenaike, CP Austin Iwar, AIG Umar Abubakar Manko and Ibrahim Idris, Leadership Newspaper reports this morning. 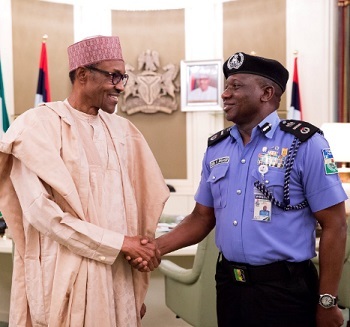 The presidency, Leadership said deliberately allowed the IGP to complete his tenure by ignoring the option of sending him on terminal leave due to the impressive manner he was handling the high rate of insecurity in the country. A dependable source revealed to LEADERSHIP Weekend that Arase’s retirement date draws closer, some senior police officers and prominent persons have started lobbying for themselves and on behalf of others. It was however gathered reliably that the presidency is more disposed to picking Arese’s successor based on professionalism, competence and integrity, which is different from the old ways of mere favouritism, ethnicity and religious considerations. Our source who preferred not be named in print said, “Although people have been lobbying for themselves and on behalf of others- one just left my office this afternoon- what I have told each of them is that the President is not somebody you go and talk to on such matters because he is a retired military Officer himself. “He understands what is good and what destroys the service. I think the easiest thing this president can ever do is to choose the service chiefs. So, lobbying would not help anybody, in fact it will even destroy your case. “I believe he will look at their antecedents, their records, qualification, competence and let me say this, nobody should lobby for anything because Buhari will not accept anybody he knows would not able to do the job. I cannot even speak to him , but if, he asks me, of course I would make an input, but ultimately it is going to be based on merit, competence, records of service, professionalism and integrity”, the source. 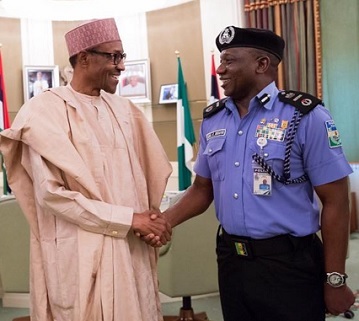 LEADERSHIP checks revealed that about four Assistant Inspectors General and two Commissioner of Police are in the line of succession as Solomon Arase bows out in June. The contest for who succeeds the current Inspector General of Police is keen, as the lobbyists are said to be doing everything possible to ensure their candidates emerge the number one Police officer for the country. It was also gathered that politicians, traditional rulers, business moguls as well as some past Inspectors General of Police have been enlisted in the various lobby camps. AIG Hassan Bala Abdulahi: Born on August 25, 1959 in Nasarawa local government area in Kano State, AIG Abdulahi holds a degree in Chemistry from the Ahmadu Bello University, Zaria (1981), a Masters degree in Law from the Rivers State University of Science and Technology and M.Sc, Strategic Studies from the University of Ibadan and is currently Phd candidate in Policing and Community Safety, Abdulahi. He is currently the AIG in charge of Zone 2. He has held several positions, including Commissioner of Police Edo, Rivers and Abia states. He is also one-time commissioner in charge of Mobile Police Force at the Force Headquarters, Abuja. Abdullah is expected to retire from service in December 2017. AIG Johnson Ogunsakin: Born on August 1, 1957 from Ekiti, Ogunsakin is AIG in charge of zone 10. The former state was Commissioner of Police, Rivers State holds a degree in Political Science/History from the University of Ife (1980). He joined the force on December 8, 1982 and is also due for retirement on August 1, 2017. He has held various command positions, including Commissioner of Police, Special Fraud Unit, and head of operations, Economic and Financial Crimes Commissions (EFCC). Olufemi Adebowale Adenaike: Born on December 3, 1958, Adenaike who hails from Ogun state joined the Police force on December 8, 1982. He is currently the AIG in charge of the Department of Training and Development at the Force Headquarters. He has held various positions, including Commissioner of police Kaduna State command and Commissioner of Police, Federal Operations at the Force Headquarters, Abuja. Has a degree in Sociology from the University of Lagos, Masters Degree in Sociology from the same university. He is due for retirement from service in December, 2017. CP Austin Iwar: He is the current commissioner of Police, Gombe State command and hails from Benue State. Before his elevation to his present position, he was principal staff officer to former IGP Sulaiman Abba, where he was responsible for the strategic management and handling of complex situations and multiple responsibilities simultaneously; assisting in the strategic planning and supervision of the implementation of NPF plans on behalf of the IGP; management of IGP’s schedules; secretary to IGP’s management meetings; management and leadership of IGP secretariat staff made up of senior officers with responsibilities for; Performance Management of the NPF; Police Reforms; Policy and Strategy; Intelligence Management; Investigation, Human Rights and Legal Issues; Strategic Communications; Intergovernmental Affairs; International Cooperation; This role also includes supervision of IGPs administrative staff; liaison with Senior Management Team. Iwar who is also a graduate of London Metropolitan University is presently a PhD candidate. What stands as an advantage for him despite being junior to the other contenders is that his state, Benue, has never produced IGP before. Besides, while the constitution says any senior officer can be made IGP, it does not specify a particular rank to be attained before qualifying for the police top job. AIG Umar Abubakar Manko: Born on June 14, 1958, Manko who hails from Niger State was a one-time Commissioner of Police for Lagos State, and AIG in charge of zone 2, before he was moved to the National Institute of Policy and Strategic Studies (NIPSS), Kuru, Jos. Manko who holds a Bachelor of Science degree in Sociology from the University of Sokoto, enlisted into the police as a Cadet Assistant Superintendent of Police on December 31, 1984. He has held several positions, including Commissioner of Police (administration), at the Police Academy, Kano; CP, Airport Command; CP, Kaduna and Sokoto states commands. Manko is due for retirement in June 2018. CP Ibrahim Idris: Having obtained two academic degrees of law and agriculture at Ahmadu Bello University, Zaria and University of Maiduguri, respectively, Idris had also attended numerous courses and trainings in Nigeria and abroad and partook in several peace keeping missions in many countries of the world. CP Idris started his police career in 1984 when he joined the force as Cadet ASP after which he was posted as Gusau Police Divisional Crime Officer in 1986 and later Unit Commander 7PMF Sokoto between 1987 and 1989. Owing to his excelling competence, unique performance, commitment to duty and doggedness, CP Idris was elevated to the rank of Deputy Police Commissioner Operations and Second in Command at the United Nations Integrated Mission in Timor Leste UNMIT between 2009 to April 2011 and again, Acting Police Commissioner UNMIT. In July of the same year he was appointed Kano State Commissioner of Police, a position he held until February 2013 when he was selected to attend Senior Police Officers Course at Nigeria Institute for Policy and Strategic Studies Kuru (NIPSS) where he bagged the prestigious mni membership.